Weather forecast for Friday and into the weekend really looked like we were in for a bad case of ice! Fortunately, at least for this area, we dodged the bullet. We even brought in more wood for our fireplace just in cast we lost power. Yeah! No need for a fire in the fireplace due to weather, but we did build one just enjoy the fire. Temperatures have stayed above freezing. It is 43 degrees right now with light rain off and on, so it has been overcast all day. We have chances for rain again tomorrow, but temperatures will be in the low 60s! Upper 40s Tuesday…upper 50s Wednesday and Thursday. Slight chances for rain Thursday and Friday. If the forecast is right, low 60s and sunshine Saturday. Generation following pretty much the same pattern. I was surprised they ran some water yesterday morning, but they did for about 4 hours then it was off the rest of the day and has been off all day today. We will see about 4 hours generation tomorrow morning, then off until 6:00 p.m. when it will come on for a few hours. Thursday, Carolyn took Jessica out for half a day. Jessica recently moved from Missoula, Montana to the state of Washington. Tough duty. Fortunately, coming from this part of the country, she was dressed for the day on the water. Hit a fish on the first cast then it went dead for a little while. As we moved down the river, things picked up and we pulled off a good day on the ruby 2 and black copperhead midges. 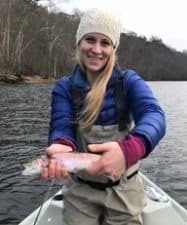 This entry was posted on Sunday, January 15th, 2017 at 4:10 pm	and is filed under Fishing Reports. You can follow any responses to this entry through the RSS 2.0 feed. You can leave a response, or trackback from your own site.